The Traffic Unit is one of the most visible parts of the Clay County Sheriff’s Office. The members are regularly honored for their achievements and traditionally rank high in both the annual Chief Challenge Competition and the MADD (Mothers Against Drunk Driving) Awards which single out agencies in Florida whose Traffic Units save lives through enforcement, education and innovation. These dedicated deputies strive hard to be the best in their field and continuously train both in and out of the classroom to stay current on the most innovative crash investigation techniques and enforcement methods. Speeding is the #1 driving-related law violation and often results in a traffic stop and a citation. If you need to pay a ticket, it can be done online through the Clay County Clerk of the Circuit Courts. The Teen Driver Challenge (TDC) Course, which is offered at no cost to students, provides knowledge and a hands-on experience to reduce their chances of being involved in a crash. The Teen Driver Challenge is not a supplemental or advanced driving course. It is a defensive driving program that covers various topics including: Vehicle Dynamics, Human Factors, Responsibility and Liability, Effects of Drugs and Alcohol, Night Driving and Aggressive Driving. 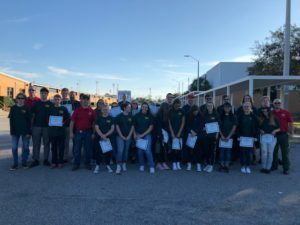 TDC students are required to have a Florida Learner’s Permit or a valid Florida Operator’s License and have use of an automobile they usually operate during the driving exercises. Contact Sgt. Keith Smith at (904) 264-6512 for more information and/or to obtain an application.